Facebook today announced several new features headed to its Facebook Messenger service. First up is augmented reality in the Messenger platform. Moving forward, brands will be able to add their own AR camera effects to their Messenger experience. Facebook says this will help people gain immediate and useful feedback about their Messenger interactions. Developers will be able to add these experiences, offer product walkthroughs, and more. The Messenger platform also adopts M Translations. This tool will let buyers and sellers in the Facebook Marketplace communicate across languages thanks to translation suggestions surfaced within their conversations. 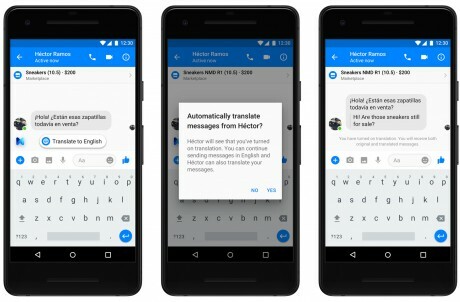 At launch, this will allow an English speaker to converse more easily with a Spanish speaker via Facebook Messenger (and vice versa), with real-time translations during Messenger conversations. Facebook is testing this feature in the U.S. and hopes to roll it out gradually over the new few weeks. Facebook today announced major changes to its Messenger platform that should make bots easier to find and use. To start, Messenger now includes a Discover tab where people can recall recently used bots, as well as use a free-form search field to seek out new bots. Google has updated its Google Translate service and made it possible to generate higher-quality translations for a handful of new languages. Specifically, Google has applied its neural machine translation technique to Hindi, Russian, and Vietnamese. I thought they were going to *simplify* Messenger? As always, what Facebook says and what it does rarely have much in common.